Now extinct, examples of Tasmanian Tigers have been found in engravings and rock art dating back to 1000BC, although they were already extinct on the Australian Mainland before the first European Settlers had even arrived. The Tasmanian Tiger was the largest carnivorous marsupial in modern times. 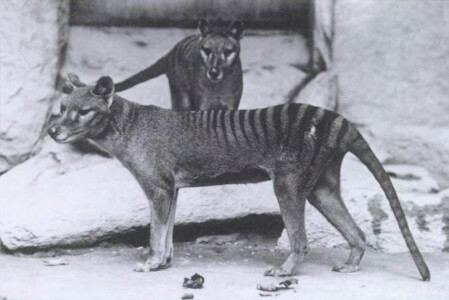 It is called the Tasmanian Tiger because of the stripes on its lower back. Its scientific name is Thylacinus Cynocephalus, which comes from Greek, meaning “Dog Headed Pouched One”. In 1986 it was declared that the Tasmanian Tiger had been extinct since 1936 after the last known individual had died in Hobart Zoo, Tasmania. Some zoologists believe they are still alive due to droppings that were found but there have been no officially confirmed sightings. The Tasmanian Tiger is thought to have been the closest relative to the Tasmanian Devil. These creatures were very shy and avoided humans so were not dangerous to us. Their extinction was due to hunting by humans as well as competition with other small predators such as dingos. It is thought that the introduction of dogs by humans as well as human encroachment into their habitat also contributed to their decline.